Plastronics currently offers the largest selection of Ball Grid Array (BGA) sockets in the industry, with over 400 options including 0.50 mm, 0.75 mm, 0.80 mm, 1.0 mm, 1.27 mm and 1.5 mm pitch sockets. All sockets can be modified to accept SuperBGA?/sup>, Ceramic BGA, Metal BGA and many others, accepting package sizes up to 50 mm depending on pitch. By eliminating the lid, Plastronics' open-top sockets can accommodate virtually any thickness BGA device with uniform, low contact resistance. Using a cam handle or rocker (for automated loading / unloading), Plastronics' open-top sockets provide true True Zero Insertion Force (ZIF) Socket (ZIF) loading. All contact forces, regardless of solder ball count, are contained within the socket and are not transferred to the burn-in board. 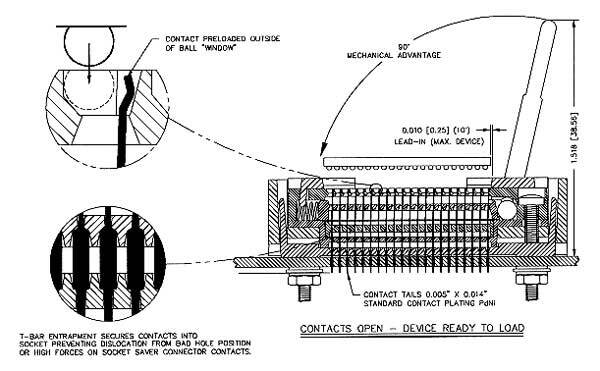 This eliminates bowing and concurrent difficulty in contacting solder balls. To make the BGA open-top sockets as cost-effective as possible, Plastronics utilizes a system of "clip-in" guide plates on the top surface of the socket. This enables the socket to accept virtually any size package, of the same pitch, that is equal to or smaller than the maximum allowable package size. Custom "clip-in" guide plates are manufactured for a minimal fee in a short amount of time, eliminating the high tooling charges of a separate socket for each individual package. Using a cam handle or open top (for automated loading / unloading), PlastronicsOpen-Top BGA sockets provide True Zero Insertion Force (ZIF) Socket loading. The zero insertion force Open-Top socket can accommodate in excess of 1000 solder balls. All contact forces, regardless of solder ball count, are contained within the socket and are not transferred to the burn-in board, eliminating bowing and concurrent difficulty in contacting the solder balls. Plastronics can also selectively load any BGA socket with only the contact pins that are required. In addition to socket cost savings, burn-in and DUT board designs become easier, simpler and less expensive. Current production includes 0.50 mm, 0.75 mm, 0.80 mm, 1.00 mm, 1.27 mm and 1.50 mm pitch sockets. All sockets can be modified to accept SuperBGA?/sup> devices, Ceramic BGA, Metal BGA and many others. Lidded versions of the 27 mm and 43 mm are also available for special applications. 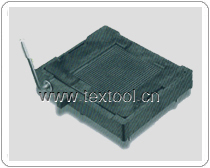 Package size of up to 50 mm can be accepted depending on pitch. By eliminating the lid on a BGA socket, Plastronics Open-Top BGA sockets can accommodate virtually any thickness BGA device, with uniform, low contact resistance. Offering various platings for our contacts allows our customers to meet their unique individual needs. Our standard contact plating is Gold with tin lead plating on the tail section of the contact. We also offer contact plating with Nickel Boron. Plastronics Open-Top BGA sockets provide maximum air-flow, minimizing heat related damage to devices. With burn-in temperatures as high as 150 and electrical currents running through the package, maximum convective heat transfer is attained with the Open-Top socket. Plastronics patented contact touches and ipesthe solder ball on the upper hemisphere, eliminating the possibility of unacceptable solder ball deformation and related problems in package solderability. Patent No. 5,419,710. With vertical actuation force (open type style) or radial motion (cam handle), the choice is yours for automated or manual loading of devices. Utilizing a system of lip-inguide plates on the top surface of the socket, Plastronics Open-Top BGA socket can accept virtually any size package (on the same pitch) that is equal to or smaller than the maximum allowable package size. This eliminates high tooling charges for a separate socket for each individual package. Custom lip-in guide plates are manufactured for a minimal fee, in a short amount of time. Open-Top BGA sockets can be delivered in as little as 2 weeks, with higher quantities and custom guide plates in as little as 3-5 weeks. Through a patented contact method, no scratching or deforming will occur on the reflow portion of the solder ball. Testing for 240+ hours at 125癈 has shown minimal impressions of 0.03mm to 0.08mm at point of contact. If Black Contact Protector / PCB Guide Plate on bottomside of the socket is not extended, gently pull it down or firmly tap socket on flat surface until the guide plate is flush with the bottom of the contact tails. Avoid touching the grid area of the socket while extending the PCB guide plate flush with the contact tails. Insert the locating pins on the Black Contact Protector/PCB Guide Plate into their matching holes on the PCB. Gently and evenly press down on the socket until it is seated on the BIB or PCB. Locate the four socket screws on the backside of the BIB or PCB.Use the mounting hardware, consisting of four (4) Nylatron washers, four (4) flat washers, four (4) lock washers, and four (4) hex nuts, in that order, to secure the socket to the PCB or BIB. It is important that the Nylatron washer is mounted next to the PCB or BIB. Gently tighten the hex nut until the split lock washers are compressed. However, if the split lock washers are difficult to see, one to two (1-2) inch/lbs of torque will be sufficient. Be cautious not to overtighten the hex nuts or damage to the BIB or PCB may occur. Rotate the cam handle or rocker cam to the open position before soldering contacts. Remove labels from the top of the socket. Rotate the cam handle or rocker arm to the open position. If the contacts are not open when loading, damage will occur to the tips of the contacts. The rocker arm closest to the end of the socket should be down, or the cam handle vertical. Place the package with the correct predetermined orientation into the socket. Confirm that the package is properly seated by gently pressing on all four corners of the package. Rotate the cam handle or rocker arm to the closed position. Do not apply any pressure to the top of the package while closing the contacts. If pressure is applied, it is possible solder mask will be scraped onto the contact, causing an insulation barrier at the solder ball. If this does occur, clean the contacts with a vacuum brush. Rotate the cam handle or rocker arm to the open position. The cam handle should be in a vertical position and very little force is needed to rotate the cam handle. Over extension could break the camming mechanism, so do not force the cam past the vertical stopping position. The rocker arm will naturally stop at the surface of the BIB or PCB. Unload the package using vertical force. Depending on frequency of use and the burn-in environment, the sockets should be inspected for accumulation of debris or solder material on the contacts or in the cavities. On regular intervals the socket should be vacuum brushed to remove these materials. In addition, the contacts might be contaminated or bent if touched by human fingers. Care should be exercised during operation, storage, and inspection to prevent any contact. For removal of solder accumulation or tin/lead on the contact tips, a citric acid wash solution can be used and will not harm the socket or contacts. Vacuum brush the contacts and socket. Inspect the socket contacts to see if any are bent or contaminated. Replace the package without pressing down on the package when actuating the cam lever or rocker arm. The sockets have snap-on guide plates on the top surface that are fitted to the size of the specific BGA package. Attempting to remove these could result in their breaking. If for any reason removal of these plates is necessary, e.g. to allow a test gauge to fit, please call Plastronics at 1-800-582-5822 for instructions. If the guide plates do break, do not replace them into the socket. Call Plastronics for replacements or instructions.